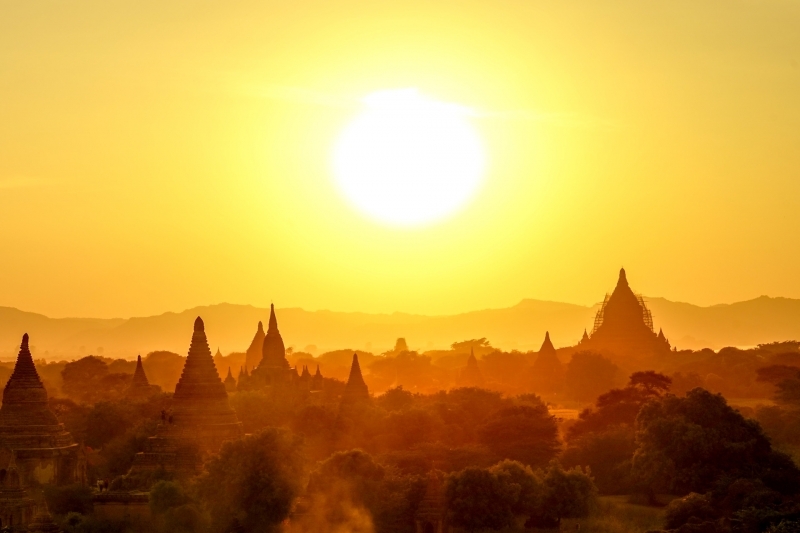 Myanmar is a land of fascinating contradictions. Known also as Burma, the country has seen periods of aggressive expansionism and extreme isolationism. It’s been the richest country in Southeast Asia and one of the poorest. It’s seen flourishing kingdoms under great rulers as well as humiliating losses brought on by despotic tyrants. to practically all of Myanmar’s great kingdoms and royal capitals. “the One-Day City” for how long it took to walk around its massive gated walls surrounded by moats, an extensive network of roads and canals, and towering religious structures. 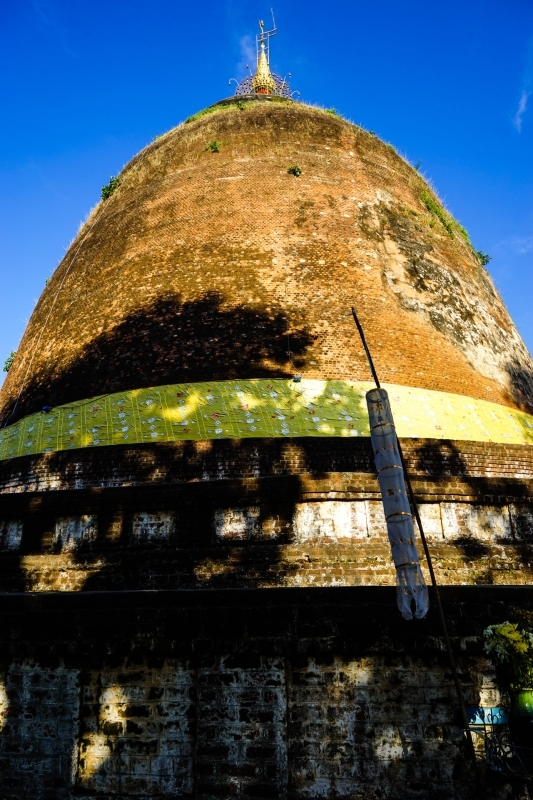 I gaze at the Phayagyi Pagoda, an unadorned mound with little tufts of grass sprouting from between the bricks, “rising from the plain like the breast of a supine giantess,” as George Orwell put it. Together, the Pyu city-states would leave a lasting footprint on modern-day Myanmar, influencing its calendar, script and religion as the first permanent footholds of Buddhism in Southeast Asia. We continue north, days of blissful ennui spent cruising past lazy pastoral scenes of beautifully monotonous fields of green occasionally broken up by streaks of white from flowering feather reeds, flashes of gold from gilded stupas partially hidden among the palm trees or bursts of firecracker red from mounds of chilies drying on the sandy banks. The soundtrack of the cruise is provided by the gentle hum of the boat, the buzzing of longboats and the occasional furious smack of laundry being beaten against the water. Along a bend in the Ayeyarwady, just before it meets the Chindwin, we explore the fabled city of Bagan, home to one of Myanmar’s greatest rulers, Anawrahta, our boat’s namesake. Ruler of the kingdom of Pagan in the 11th century, Anawrahta conducted military campaigns over 33 years in every direction, finally succeeding in unifying the Ayeyarwady Valley under a single sovereign with borders that closely resemble today’s Myanmar. its thousands of religious monuments, testifying to the might and riches of the Pagan Kingdom. After Pagan fell to the Mongols towards the end of the 13th century, the former capital city slowly diminished to a small village and its many royal artisans and craftsmen left for the area around Mandalay, with only the craft of lacquerware returning. We observe with admiration the skill and patience of the Bagan artisans working at this time- and labor-intensive process involving up to 12 layers of lacquer followed by intricate designs engraved completely freehand with a metal stylus and colored with fine stone powder. Myanmar’s next expansionist leader was King Bodawpaya, ruler of the Konbaung Dynasty in the late 18th century. His ambitious armies invaded Siam to the east and conquered the kingdoms of Arakan and Assam in the west, extending his borders all the way to British India. We visit Mingun and the gigantic 170-foot base of the Pa Hto Taw Gyi Temple built using thousands of Bodawpaya’s prisoners of war. Had it been completed, the temple would’ve been almost 500 feet, as high as the Great Pyramid of Giza. 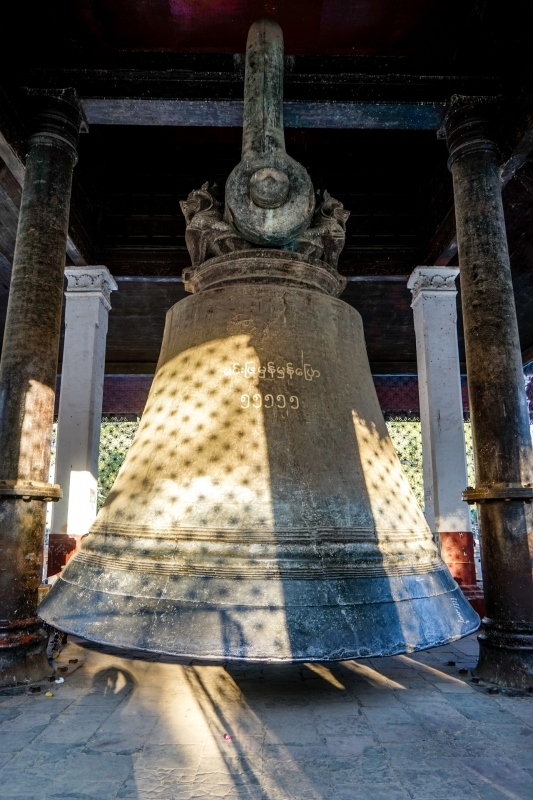 To go with his massive temple, Bodawpaya also had a giant 90-ton bell cast, and we watch with humor as people give themselves a bout of self-induced tinnitus by standing under the Mingun Bell while friends give it a mighty whack with a big stick. the first of three Anglo-Burmese wars. At Danuphyu, the sound of a thousand angry bees turns out to be young monks reciting scripture at the Pali University. On the grounds, we visit the memorial to General Maha Bandula, the commander- in-chief of the Royal Burmese Armed Forces. A beloved national hero for standing up to the British during the First Anglo-Burmese War, Bandula’s courage would prove no match against British technology—Congreve rockets and the first steamship ever to be deployed in wartime. shape the pots and then imprint them with a trademark starburst pattern. 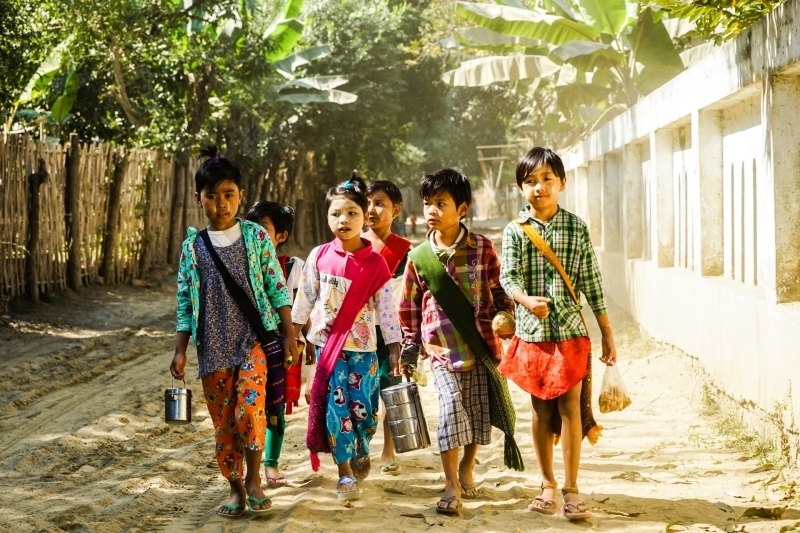 The rhythmic sound of their paddles reverberates in the still air, recalling the Burmese proverb: If you want a well-behaved child, you should beat them like a pot. Just 50 miles south of the then capital of Ava, British troops amassed in humble Yandabo in 1826, forcing King Bagyidaw to sign the Treaty of Yandabo. The first Anglo-Burmese War ended with Burma having to pay a large indemnity of one million pounds sterling and ceding Assam (now in northeastern India) to the British along with other western lands. A second, briefer Anglo-Burmese War would follow in 1852, started by a trade dispute and ending with Britain annexing all of Lower Burma. Just outside of Pyay, we sail past the historical border between Upper and Lower Burma and the “tax mountain” of Akauk Taung where boats had to stop and pay tolls between the two territories. 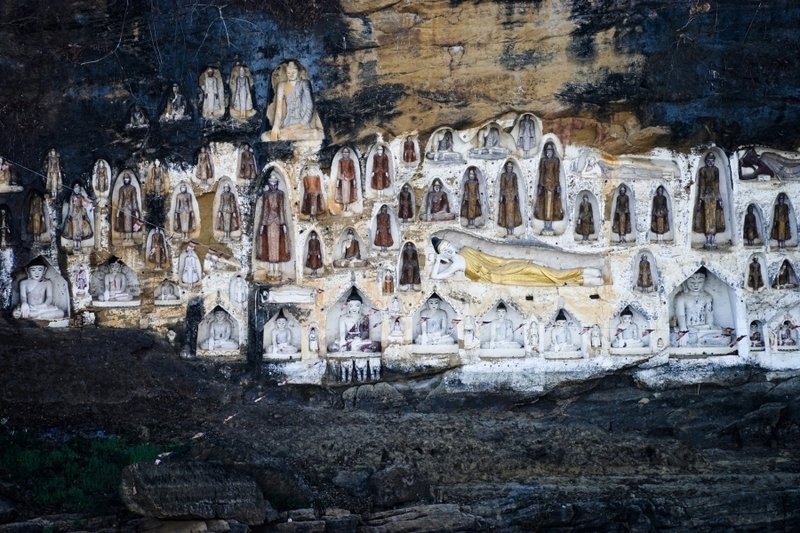 When stuck waiting for favorable weather, the sailors whiled away their time carving hundreds of Buddha images into the rock face. No divine help, though, was able to prevent Burma from being swept up by the age of colonialism, which would see a fifth of the world’s landmass subject to colonial rule. For the first time in a thousand years, the long line of Burmese kings was about to end. in the Indian Imperial Police force in Burma, George Orwell exposed the dark side of colonialism. While admittedly bringing a certain sense of order and technological improvements, Orwell’s tortured protagonist admits to living a lie, “the lie that we’re here to uplift our poor black brothers instead of to rob them,” unleashing the scourge of “Pox Britannica” instead of Pax Britannica. While Britain gained control over Burma’s oil, precious metals, gems, teak and world-leading rice production, the “pox” thankfully left Burmese society largely alone, treating the country much like a “Cinderella Province”—beautiful but ignored. the cups of tea mixed with condensed milk and dusty colonial-era buildings, oddly out of place with their ornate, dilapidated facades sprinkled amongst plain, tin-roofed, wooden homes. After independence, Myanmar would wipe out most traces of British rule, changing over 600 place names back to the original Myanmar, resulting in Yangon instead of Rangoon, Myanmar instead of Burma, and a reversion to right-hand driving. Any remaining links are tenuous at best, romantic notions made rosier by time. 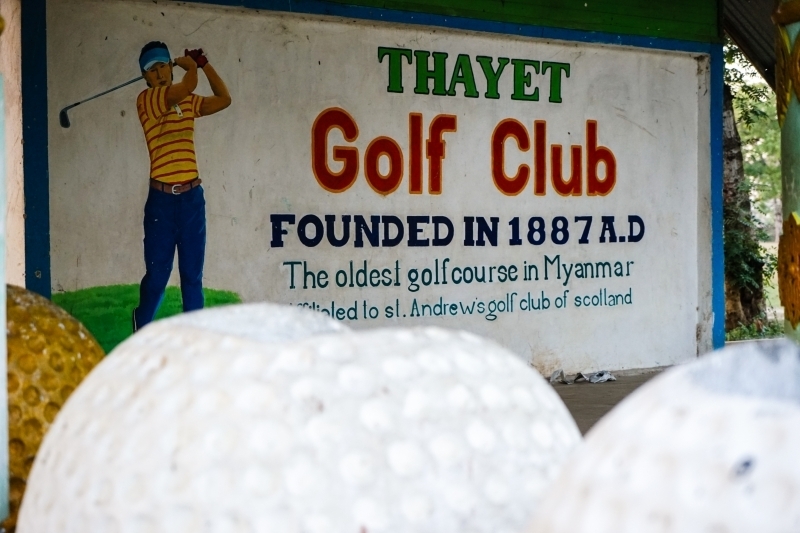 In the dusty town of Thayet Myo, we ride horse carts to the Thayet Golf Course proudly “affiliated to St. Andrew’s golf course of Scotland.” Founded in 1887, the country’s oldest golf course is mainly used by government officials, much like it was under the Raj, and a 9-hole round costs less than a dollar. Over champagne and nibbles, the manager tells me that only one person has taken advantage of the USD300 lifetime membership so far which promises member privileges at lofty St. Andrew’s, seemingly an empire away from these local fairways where stray cows graze. Our last stop is Mandalay, home to Myanmar’s last king, Thibaw. The city is known for its many craft workshops including weaving, wood and stone carving and gold-leaf beating, producing the incred- ibly thin gold leaf used to apply to religious images. At the Mahamuni Temple, we see the revered Mahamuni Buddha image, purportedly one of only ve images made in the likeness of the Buddha during his lifetime. Only men are allowed to approach the image, which is now bubbly with thick layers of gold leaf applied by the faithful. We travel up to Mandalay Hill for panoramic views of Myanmar’s second largest city and notice a large green square of forest where the royal palace once stood, almost completely razed by allied bombing in WWII against Japanese occupation. On the last afternoon of the cruise, we make our way to the nearby U Bein Bridge. 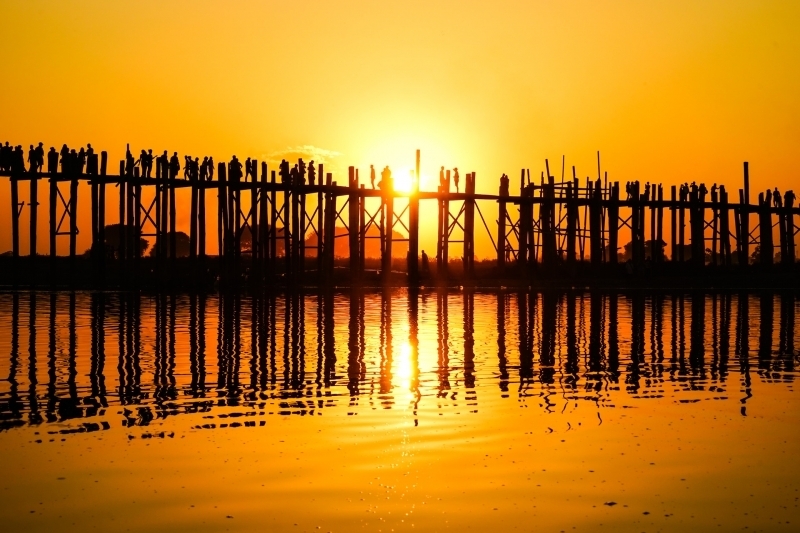 With 1,086 pillars, it’s the oldest and longest teakwood bridge in the world. 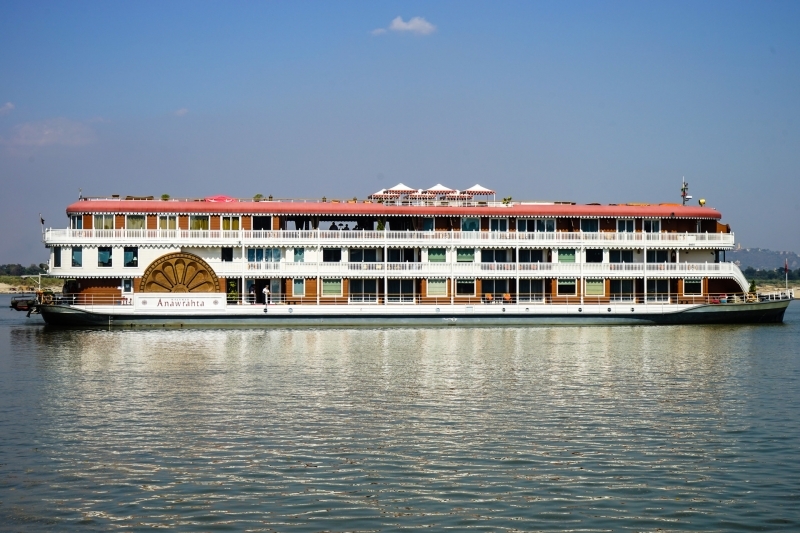 Champagne glasses in hand, we drink to what has been an unforgettable cruise into the fascinating history of Myanmar. With the bridge beautifully silhouetted against the dying orange sun, I think about the final Burmese days under “the empire on which the sun never sets”. After more than a century of British rule, Myanmar would finally regain independence in 1948. However, those happy days would be short-lived with the country trading a foreign oppressive ruler for a homegrown one. The true fight for freedom was just beginning.